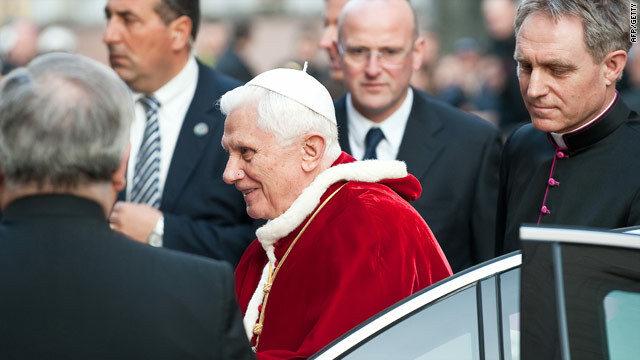 LONDON, England (CNN) -- Pope Benedict XVI will visit England and Scotland from September 16-19, Queen Elizabeth II announced. It will be the first state visit to the United Kingdom by a pontiff, the Foreign Office said, noting that Pope John Paul II's 1982 trip was officially a pastoral visit, while Benedict's is a "papal visit." The official announcement comes as the Vatican reels from accusations that it did not do enough to stop child abuse by priests, nuns and other Catholic authority figures across Europe for decades. Benedict is working on an official statement, or pastoral letter, to Catholics in Ireland, where a damning government-backed report into child abuse by priests prompted four bishops to resign last year. There have also been widespread accusations against priests in Germany, Austria and the Netherlands. The queen will receive the pope at the Palace of Holyroodhouse in Edinburgh, Scotland, during his September visit, the Foreign Office said. Benedict will give "a major speech to British civil society" at Westminster Hall in London and will beatify the 19th-century theologian and educationalist Cardinal John Henry Newman at a public Mass in Coventry, England. Beatification is one step shy of sainthood. The pope's visit comes at a time of heightened tensions between Rome and the Church of England following the Vatican's outreach to disaffected Anglicans last year. The head of the Church of England, Archbishop of Canterbury Rowan Williams, said the visit would be an opportunity to "cement ties" between the Roman Catholic Church and other Christian churches in the United Kingdom. "I look forward particularly to welcoming Pope Benedict to Lambeth Palace on behalf of the Church of England," Williams said in a statement, referring to the archbishop's official London residence. Williams met Benedict in Rome in November, not long after the Vatican said it had worked out a way for dissatisfied Anglicans to switch allegiance en masse to Rome. Some observers said the move will shatter more than 40 years of efforts to reconcile the Catholic and Anglican churches. Williams was said to have been surprised by the move, which critics described as an end run around a long-established Catholic-Anglican dialogue. Catholic and Anglican theology and rites are broadly similar, but Anglicans have long allowed priests to marry and have children. In recent decades, the Anglican Communion has allowed women to become priests. The Episcopal Church -- the U.S. branch of the Anglican Communion -- has ordained openly gay bishops. Those developments have caused controversy within the communion, with more conservative parishes setting up alternative structures of authority. There are about 77 million Anglicans worldwide and about 1.1 billion Roman Catholics.